Do some practice at home. Pilates is like learning a new language, the more you practice, the more you learn. Now it is common sense that the more often you practice something the better you become at it. 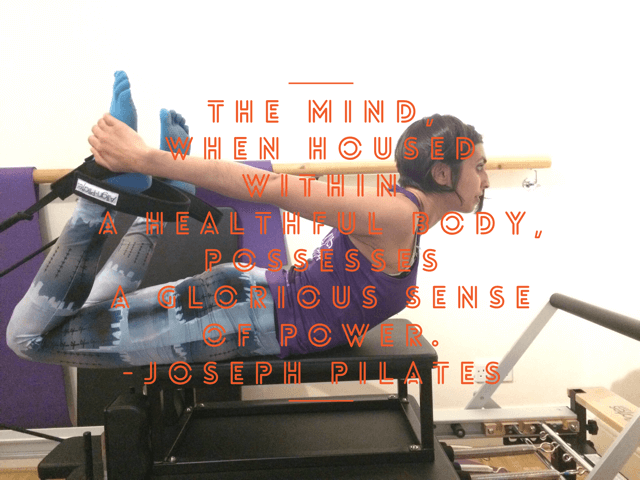 Therefore doing some Pilates practice between classes will help you massively. If you can practice lying in neutral and breathing, correcting your posture and a move that you enjoyed in class it will help. Check out our youtube channel for videos and sequences you can try. Slow down and breathe, breathe, breathe. Pilates is a marathon and not a sprint. Breathing is obviously something that we do all the time but we don’t always take the time to do properly. Focus on the breath going into your ribs, so they expand out to the side. The breath also expands your tummy and your back too. I always talk about rib cage placement. In all posts avoid the ribs flaring out, instead bury them down towards your hipbones so the abdominals engage. If your ribs flare up when you lift your arms or legs, concentrate on there being a heaviness on your chest and your core engaging more. It may also be you need to reduce the range of movement in your shoulders and legs. A focus on your posture is so key. What you do in class is a tiny fragment of your week, so finding the posture cues you need to work on is totally crucial. Whether it is adjusting your head position or bringing your pelvis into neutral more often. It all makes a difference. Pilates is one of those exercises that can be done on a complete shoe string. You don’t need any fancy equipment or snazzy clothing. You don’t NEED it, but sometimes it helps. Here are the top 5 Pilates bits and bobs that I wouldn’t be without. Do you need a mat at home? Hmmmm, I would say yes you can do. I sometimes try moves out when prepping for a class and don’t have a mat to hand and it is an altogether different experience. A mat offers a non slip surface and extra cushioning, it offers safety and gives you a set space to exercise on. That extra cushioned mat really makes all the difference for some of the rolling moves and the prone positions. So it is worth investing in a mat you love and a mat that brings you comfort. Personally I would steer away from anything less than an 8mm thick mat. Lots of the yoga mats are quite thin, which from my understanding is to keep you connected to the groud. Pilates is not yoga, you need that extra padding! We have the Airex Coronella mats in the studio which are not cheap, but you can get a decent one on Amazon for a good price if you search for a thick pilates mat. If you are local to us then we stock these in our studio, or you can buy online from Pilates Mad and use the code PRIYATOESOX for 10% off. These babies are amazing. Pop one in your bag and you can give yourself a massage wherever you are! Great on the feet, shoulders, neck and bum but can be used all over. Now I’m all for a bargain in life. But I’ve learnt now, pilates leggings need to be good leggings and it’s worth spending a bit more on them and checking them regularly. I see lots of leggings that are see through or have holes! One of my teaching friends uses the hashtag #leggingsarenottrousers which I agree with to an extent. If you have decent leggings then they can be passable on the school run too. Plus if you have fancy leggings life is just that bit better – or is that just me?! So versatile and great for stretching as well as adding resistance to those pilates moves. This is one great piece of kit as a band folds up so small so you can take it away with you on trips. Really useful for stretching your hamstrings after travelling or a day of sitting. Also fabulous for toning the arms and for adding variety to a range of pilates exercises. You can pick these up online pretty easily or come to the studio and we have a stock of them.